culled from every artistic niche of the country. Enthralling miniature, folkloric Patachitras and Madhubani, Warlis and Saura tribals paintings, mystical Thangkas, beautiful Batiks, glorious Glass paintings and more are here for you to explore and marvel at the diversity and magnificence of artistic India. 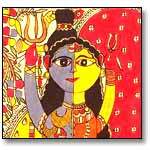 All these original paintings have been collected directly from Indian artists. Indian Miniatures are intricate illuminations executed with subtle brushwork. 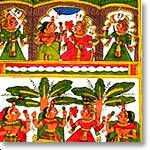 View All... Madhubani painting originated from the daily rituals of simple folks in Bihar. 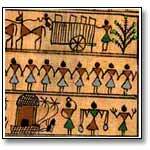 Warli painting derives its name from a small tribe inhabiting the remote regions of Gujrat, India. 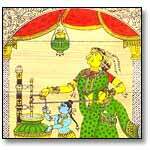 Patachitra is a vibrant folk art form native to Orissa, a state in eastern India. 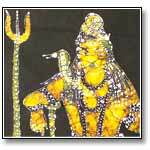 Glass painting comprises of engravings laid down on the back of the glass. 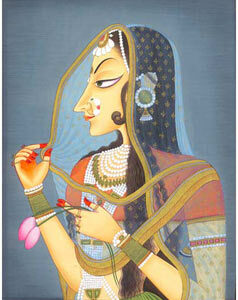 Rajasthani Phad is a beautiful specimen of Indian cloth painting. 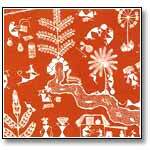 Indian tribal painting is the repository of traditional wisdom and knowledge. 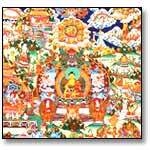 Buddhist Thangka painting is noted for its sublime theme, brilliant colors and intricacy. View All... Batik refers to the art of dyeing fabric by using wax resist technique.